The British Oceanographic Data Centre (BODC) announces the availability of historical sea level data from charts and ledgers, made possible with funding from the Marine Environmental Data and Information Network (MEDIN), matched by BODC funds. 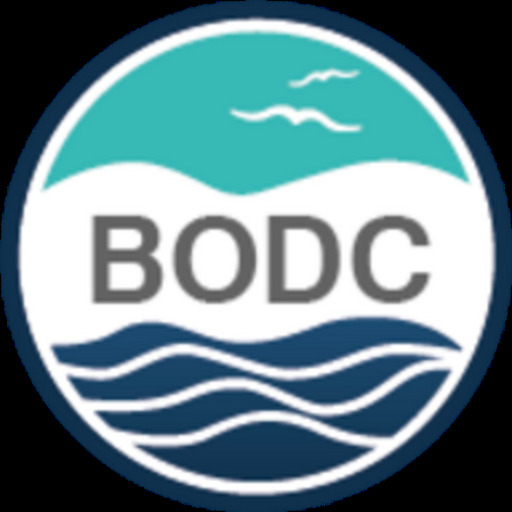 BODC was in possession of several large historic sea level datasets in the form of scanned images of tide gauge charts and ledgers. These images have been added to the National Oceanographic Database (NODB) and are now freely available to registered users (subject to a licence agreement). These scanned images are from eight tide gauge sites around the UK. The ledgers for Sheerness contain some of the earliest records (1870 onwards) of sea level data in the UK. Other ledgers came from the Mersey Docks and Harbour Company, and include several sites around Liverpool. The tide gauge charts are from Belfast. Long-term sea level records have a wide range of scientific and practical applications. They are important to climate change studies (to give an indication of sea level rise), operational oceanography (looking at storm surges and tides) and civil engineering (flood defences) amongst others. The oceans have a major influence on our climate system and cover 70% of the Earth's surface; yet relatively little is known about them. To improve our understanding vital data from previously data-sparse ice-free deep ocean areas is being collected by Argo - an international programme which was established in 2000. In 2007, Argo achieved its aim to create a global array of over 3000 profiling floats; these provide about 100,000 observations each year. One UK float, deployed in North Atlantic during October 2005, has completed 187 cycles and is approaching a complete loop of the North Atlantic sub-polar gyre - a large, permanent, circular rotation of ocean water. The float continues to supply good profiles and application of the Owens and Wong (2009) calibration method reveals no significant sensor drift over its lifetime. More details of its voyage and the data it has collected are provided below. October 2005 — a Apex float WMO# 6900388 is deployed at 61° 15.6' N, 20° 0.6' W.
The float operates a 10 day cycle, whereby it drifts for 9 days at a depth of 1000 m to provide circulation information before descending to a depth of 2000 m. Once it reaches 2000 m it begins an ascent to the sea surface, as it rises it measures the water temperature, salinity and pressure. At the surface it transmits the data it has collected to a receiving station via satellite and descends to a depth of 1000 m, to repeat the cycle. Spring 2007 (1) — the float passes the southern tip of Greenland and encounters its first injection of cold and fresh water into surface layers. This water originates in the Arctic and despite its low temperature remains buoyant due to its low salt content. January 2008 (2) — a similar cold and fresh water surface event is seen, however by this time the float has crossed the Labrador Sea and is following the Newfoundland continental shelf. During this period it travels up to 200 km between its 10 day cycles, which equates to an average speed of 20 cm s-1 whilst drifting at a depth of 1000 m.
February/March 2008 (3) — the floats data shows clear evidence that the upper 2000 m of the water column are well mixed, with both temperature and salinity remaining more or less constant. This seasonal deepening of the mixed layer, due to winter storms, is present but not so obvious in the data from the other years. Autumn 2008 (4) — the float meets the northern boundary of the Gulf Stream and is deflected eastwards. Autumn 2008 onwards (4+) — the float's increasing meandering path and the fleeting encounters with warm and cold water features as it crosses the eddy field illustrates the Gulf Stream's energetic and unstable flow. 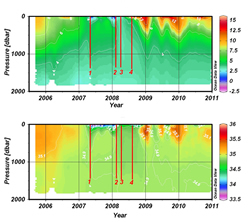 Although there is always a seasonal signal present in surface water temperatures, during the floats journey at the boundary of the Gulf Stream a more chaotic signal is superimposed due to interaction with the fringes of the warmer current. 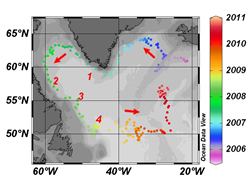 The overall journey helps illustrate the circulation features in the North Atlantic. In particular the narrow, linear flow around the north of the basin which contrasts with the turbulent progress of the Gulf Stream in the south. Full size and additional data plots are also available in an Adobe PDF (2 MB) document. With over 3000 floats active at any one time, it is inevitable that paths may cross. The final plot shows the path of our float (red) when compared with an Argo Canada float (blue). These are overlain on an annually averaged temperature colour map at 1000 m depth supplied by the UK Met Office FOAM hindcast model. It appears that our float has followed the north-western arm of the North Atlantic current and may commence a second circuit. 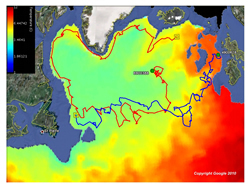 Whereas the Canadian float has taken an alternative route traveling up the Rockall Trough, another main arm of the current, which carries warm water toward Norway and Polar regions. Owens W.B., Wong A.P.S., 2009. An improved calibration method for the drift of the conductivity sensor on autonomous CTD profiling floats by theta-s climatology, Deep-Sea Research Part I: Oceanographic Research Papers, 56(3), 450-457. The British Oceanographic Data Centre (BODC) acts as the data centre for UK floats in the Argo programme, regardless of their location. We also act as the Regional Data Centre for the Southern Ocean in collaboration with the Commonwealth Scientific & Industrial Research Organisation (CSIRO), Australia.